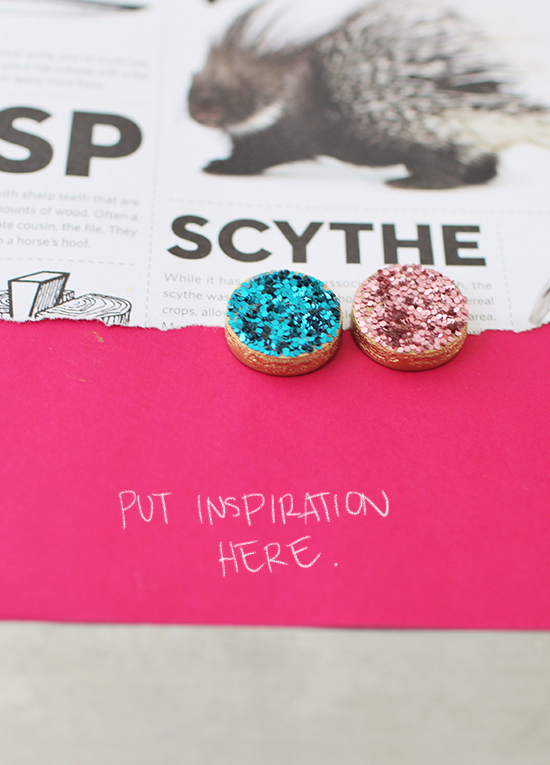 we’ve been doing some intense DIY posts around here lately…it’s time for a simple craft today! one that only takes a few minutes. 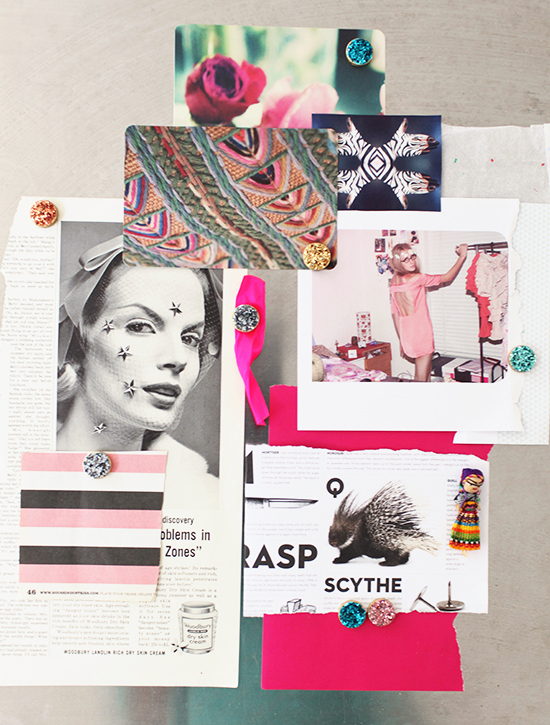 i have always made inspiration boards to keep up around me while i work and i’m constantly switching items in and out. 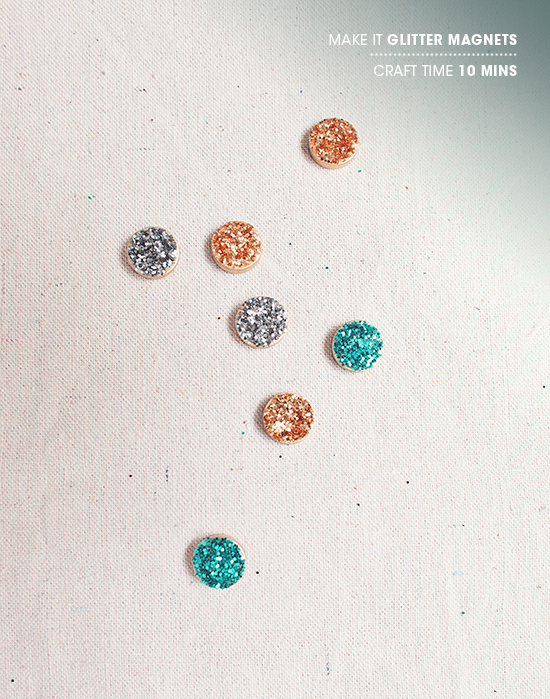 you could definitely use these glitter magnets on your fridge to add some sass, but i chose to hang up some my recent inspirations in my office. these would be a cute gift in a little see through bag for a friend! and thanks martha stewart for blogging our ombre pendant lights! GORG! Totally making these, like today!! When I make is it cool if I link back to ya for the original inspiration?!?! LOVE these adorable magnets, Bri! So creative and festive, especially with the holidays around the corner. Will definitely be making a set of my own this weekend! Great activity for kids! (and older kids!) Super cute. the world needs more glitter! So cute and simple, I love little crafts like this. I might have to try this over the weekend. I’m totally making these to go on my fridge. Simple and easy.. Mine might all be gold though! hi ange. 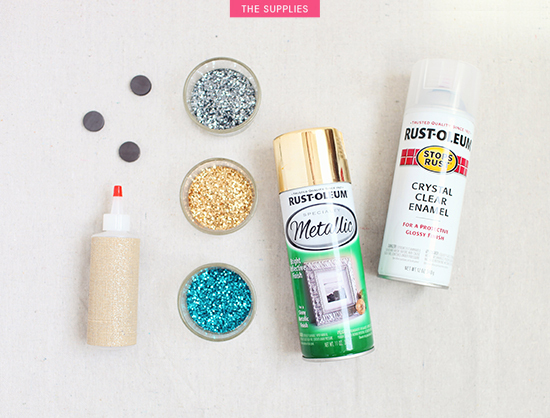 i have never seen that glitter magnet DIY before, that was a coincidence. with such a simple craft, there is bound to be other people who have tried it. we do have our own spin on it, luckily 🙂 thanks for pointing those out to me though. Ange, they say great minds think alike and I can assure you that we glued and glittered independently of other craft blogs. With as many craft posts as we do I imagine some projects being found elsewhere is inevitable. This is a really fun and easy project, so where ever you found it I highly suggest you give it a go. What a fun craft and way to decorate the office up! DOING THIS! So simple and cute! Love it! So fun, easy and pretty! Holy bananas, these are adorable! I’ve got my glitter ready and I’m craftin’ up a storm next weekend! These are 1,000% going on my to-do list! 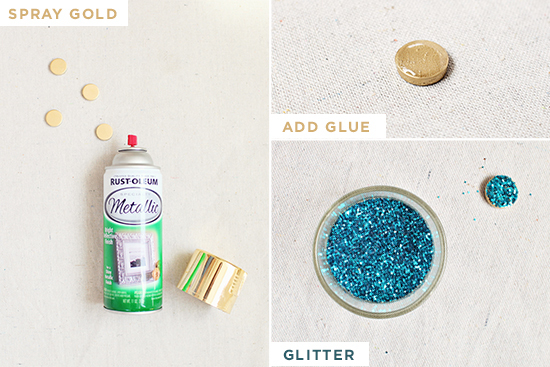 Love simple DIY’s … especially the kind that involve glitter! I love the clear bowls with the gold rims you used to hold they glitter! What a great project! Congrats on the Martha Stewart guest blog!!! Love this craft! Will feature a link to it from Bubblegum Post tomorrow morning! Pingback: 18 Miniature Craft Projects That Will Melt Your Heart | シ最愛遲到. !